Truly stunning song-writing marks a brilliant debut from Todd Agnew. Stylistically similar to the Dave Matthew's Band and Creed, songs 'This Fragile Breath' and 'Grace Like Rain' are a great introduction to this worship filled album. 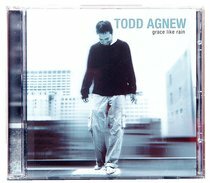 Praise & worship singer and songwriter Todd Agnew was born March 15, 1971, in Dallas, TX. With a kind of indie rock approach, pop-oriented style, and unique voice, Agnew's spiritually directed songs aren't quite like anything else in the contemporary Christian market. Basing himself in Memphis, TN, and working through Ardent Records, he has released several albums with the label, including Grace Like Rain (2003); Reflection of Something (2005); his ambitious retelling of the Christmas story, Do You See What I See? (2006); and Better Questions (2007). Agnew relocated back to Texas in 2008.